Genuine Gibson care kit for your guitar banjo or mandolin. 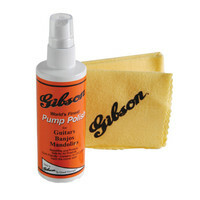 Keep your instrument looking as great as the day you bought it thanks to Gibsons pump polish and cloth combo. This entry was posted in Gibson and tagged Guitar-and-Bass. Bookmark the permalink.